The Bureau of Economic Analysis (BEA) recently released its statistics on gross domestic product by metropolitan area for 2014, which we previously analyzed here. The data included insightful information regarding GDP growth across the country. We built a map to provide a 3D visualization of the GDP growth by metropolitan area, seen below. The higher the cone rising out of the map, the greater the GDP growth in that area. As we discussed, GDP growth increased 2.3% in 2014 as compared with 1.9% growth in 2013. The industry with the highest growth was professional and business services. 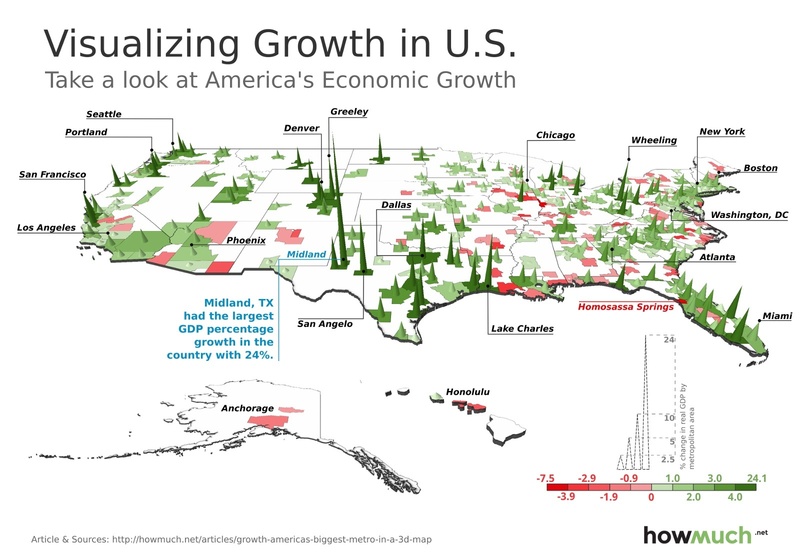 Midland, TX had the highest GDP growth for any metropolitan area in the country at 24.1%. Another Texas metro area, San Angelo, came in second with 11.4% GDP growth. San Angelo had 1.85% growth in durable goods manufacturing and 1.09% growth in professional services. Lake Charles, LA came in third with 10.3% GDP growth. Lake Charles saw growth of 3.76% in the construction industry. Greeley, CO was fourth in GDP growth at 9.9% with 3.65% growth in natural resources and mining. Wheeling, WV rounded out the top five with 9.5% growth. Wheeling saw 7.93% growth from natural resources and mining. The New York metropolitan area has the highest GDP in the country with $1.5 trillion, itsaw growth of 2.4% in 2014. Financial, insurance and real estate contributed 1.1% of GDP growth in the New York metropolitan area. The greater Los Angeles area is the second largest GDP area at $866 billion, it saw an increase of 2.3% over 2013. The Los Angeles metropolitan area saw growth in professional services with an 0.64% increase and a 0.40% increase in finance, insurance and real estate. The Chicago metropolitan area was third with $610 billion and growth of 1.8%, it realized growth of 0.67% in professional and business services. The Dallas metropolitan area had the highest GDP growth at 8.5% out of the top 10 metro areas by GDP. San Francisco metropolitan area had the second largest GDP growth of 5.2% of the top ten metro areas. The Atlanta metropolitan area was third with GDP growth of 3.0%. Washington D.C. had the lowest GDP growth in the top ten metropolitan areas at just 0.3%. The BEA numbers showed that GDP grew in 282 of the 381 metropolitan areas. This growth was fueled by a number of industry groups led by professional and business services, wholesale and retail trade, finance, insurance and real estate. Professional and business services accounted for 27% of the GDP growth (0.61% out of 2.3%). This industry grew in 314 of the 381 metropolitan areas, and is responsible for more than half of the GDP growth in 49 metropolitan areas. Wholesale and retail trade contributed 0.34%. Finance, insurance and real estate contributed 0.34% to GDP growth. Texas had two of the highest growth metropolitan areas with Midland and San Angelo, as well as Dallas with the largest growth for metropolitan areas in the top ten in GDP. GDP growth was driven by a number of different industries across the country, although professional and business services accounted for 27% of the GDP growth (0.61% out of 2.3%).